"For everyone who has come to the "Blast" pages and seen nothing or next to nothing, I apologize -- as I understand it, our ISP has been making some server changes which have caused some minor technical problems. We're working to get them squared away, and I expect it to all be back to normal soon. Thanks for your patience! Now for some good news and bad news. The bad news first -- it looks like the TMNT TV show which we are hoping to get on the air in the next couple of years will NOT be CGI. I am very disappointed, but for whatever reason, the powers that be at the networks which have shown the most interest in a TMNT show don't want a CGI one. I don't really understand their reasoning, but at the present time if there is to be a TMNT show on TV, it will be some style of cel animation. However, there IS something of a possible silver lining in this cloud, and that is that there may be an opportunity to do some kind of CGI turtle project down the road -- maybe a direct to video thing. I would dearly love to do something in CGI with the turtles. Next bit of (sort of) bad news -- due solely to my own absentmindedness (i.e not being totally on top of scheduling/planning) and slowness in inking, the first issue of my new TMNT comic book will be in the Diamond Previews catalog for a December 2001 release. On the other hand, the GOOD news is that it is DEFINITELY going to be in Previews, and WILL be published in December. 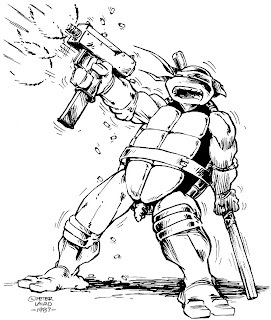 Now for the good news -- I finished inking TMNT #2! This week I completed the last few pages, erased all the stray pencil lines, and will shortly be starting to tone the pages. Other good news -- Jim Lawson has been pencilling issue #3, and today is up to page 20 (and this issue is going to be 40 pages!). I may have to enlist the help of one or more of my studio pals with inking from here on out, but I'm not 100% sure of that yet. I've also settled on a title for the new book -- it will be called simply "TMNT" (possibly with "Teenage Mutant Ninja Turtles" as a very small subtitle), and it will be published by Mirage Publishing. "However, there IS something of a possible silver lining in this cloud, and that is that there may be an opportunity to do some kind of CGI turtle project down the road -- maybe a direct to video thing. I would dearly love to do something in CGI with the turtles. I believe Imagi, 4Kids, Weinstein, and WB, would still be up for a direct to DVD project (Playmates too, they would now actually have a reason to continue using the movie figure molds), or maybe a new CGI TV series("Clone Wars" is doing gangbusters in the ratings department). -->> ..can't believe it's almost ( ALMOST ) 30 issues later in TMNT volume 4. Get out the paint guns !! I know this is way off subject but Peter is anyone from Mirage going to be at NYCC 2009? I actually get to go for once. I know this is way off subject but Peter is anyone from Mirage going to be at NYCC 2009? I actually get to go for once."